A trip to the doctor or visit to the pharmacy is nothing special to most Canadians, but for many refugees the question of healthcare comes at a much higher cost. “We’ve seen clients who’ve had to choose between vaccinating their children and paying for groceries,” says Gillian Zubizarreta, settlement coordinator for the Halifax Refugee Clinic — a non-profit organization that provides legal services to refugee claimants in Nova Scotia. She spoke on Halifax’s third National Day of Action to stop cuts to refugee healthcare, which took place across 17 Canadian cities Monday. 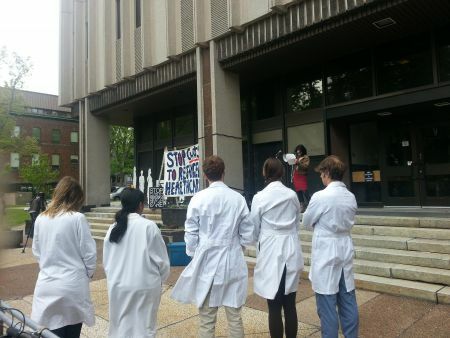 Doctors dressed in white coats were joined by more than 50 protesters on the steps of Dalhousie’s Sir Charles Tupper Medical Building to call on the federal government to reverse the 2012 cuts made to the Interim Federal Health Program. The program provides health insurance to refugees in Canada, says event co-organizer Tim Holland, physician and co-founder of the Halifax Transitional Health Clinic for Refugees. He says these cuts have stripped refugees of their healthcare coverage and left them to pay medical expenses out of pocket. Prior to the cuts, he says all refugees in Canada had access to the same health benefits, but now there is a confusing system that determines a refugee’s need for health care on the basis of immigration status. 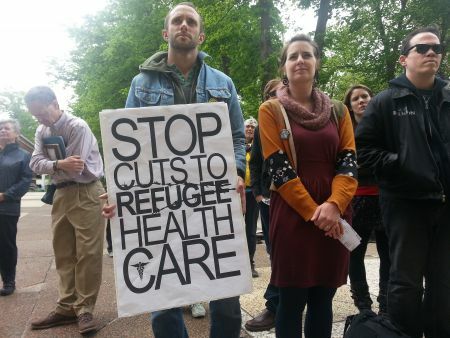 “Refugee claimants are left with essentially no health care,” he says. The Canadian Council for Refugees reports that these cuts have led to confusion by health care providers and anxiety for refugees who cannot cover the cost of medical bills, doctors’ appointments and medications. Under the new program rules all refugees, except for government sponsored refugees, are denied access to all healthcare services, including vision and dental care. “It denies them the most basic health needs, such as prenatal acre or insulin for diabetes,” Holland says. In 2012, approximately 100,000 refugee claimants had their health care revoked when the cuts were announced, Zubizarreta says. She believes the federal government’s responsibility to provide health care has since fallen onto the shoulder of provincial governments and community organizations with limited resources. Refugee healthcare now relies on the ‘good-will’ of physicians who provide patients with free medical care, as well as pharmacists who charge low-costs for medications. Holland believes new efforts to provide refugee healthcare, such as the Halifax Transitional Health Clinic for Refugees, are a start, but are ultimately still a “ bandaid’ solution. He says a non-profit volunteer run clinic cannot provide specialist appointments, psychiatric services and diagnostic imaging. Not only does he see the federal government’s healthcare cuts as damaging to people’s lives, but also costly to Canadian taxpayers. In 2013, Citzenship and Immigration Minister Chris Alexander announced refugee claims to Canada had not been this low in decades. Zubizarreta says Nova Scotia has one of the smallest refugee populations, but that does not change that healthcare should be a basic human right for everyone.